NEW YORK (CNNMoney) - The black unemployment rate is no longer at a record low, after jumping nearly a percentage point to 7.7% in January, according to today's jobs report from the Bureau of Labor Statistics. The spike offers a good lesson about the risk of claiming responsibility for market trends. President Trump repeatedly said the unemployment rate for African Americans had sunk to an all-time low because of his economic policies. 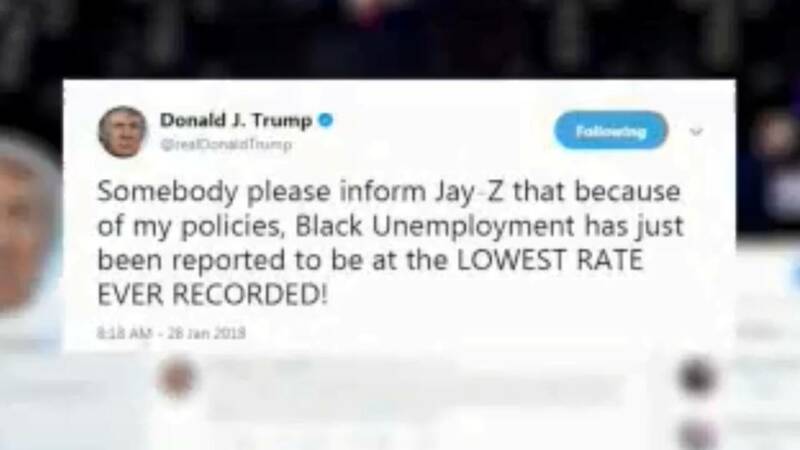 He even tweeted about it in response to criticism from Jay-Z over the weekend. True, the rate did hit 6.8% in December, which is the lowest point on record. But so far, he hasn't accepted any of the blame for the latest increase. But, experts say, Trump probably isn't responsible for either move. The black unemployment rate had been sinking fairly steadily since its recession-era high of 16.8% in March 2010. However, it bounces around more than the white unemployment rate because it's based on a smaller population. Black unemployment has dropped or jumped by more than a percentage point in a month several times in the past decade, so we shouldn't read too much into January's move. Of course, it's possible that African Americans who weren't actively looking for work before heard about the very low unemployment rate and decided to start looking for a job in January, when before they might have been deterred by a job market that is still less friendly to black people than whites. But if that were true, the black labor force participation rate -- which measures the percentage of people who either have a job or are looking for one -- would have risen. Instead, it sank slightly, from 62.1% to 62%, after trending upwards for about four years. The unemployment rate for white people sank in January, from 3.7% to 3.5%, while the Latino unemployment rate rose slightly from 4.9% to 5%.